Before judging him or her, all of us have at one time ingested a fair share of questionable meal choices. What’s the most effective way of eliminating the awful morning breath? ​Jokes aside, your dog's dental hygiene is very important. In fact, it plays a huge role in his or her overall health. If you love your pet as I do, then you’ll take his oral health seriously. Chances are high that if you’re high reading this, you want to implement an efficient brushing routine. Dogs aren’t prone to cavities like humans. This is because they ingest less sugary foods as well as oral bacteria. Nonetheless, they are susceptible to an array of other risks that lack of upkeep can cause. Some of the risks include tartar build-up, tooth loss and gum disease. To help you prevent your pet from these issues, you need to brush his or her teeth with the suitable​ dog toothpaste. How Do I Choose Toothpaste For My Dog? Desired flavor – For instance, is your pooch into strawberry? If yes, then settle for a toothpaste that tastes like strawberry. Other flavors you can choose from include vanilla flavor, seafood flavor, poultry flavor, beef flavor etc. No harmful ingredients/chemicals – Toothpaste with harmful ingredients or chemicals such as those, which cause foam, should never find their way to your dog. They harm the digestive system of your pet. No artificial sweeteners – Avoid dog toothpaste with artificial sweeteners since they are harmful to your dog. The SENTRY Petrodex Enzymatic Toothpaste is specially formulated for dogs. It not only helps fight bad breath, it’s also magical in helping control plaque and removing food debris. It comes in poultry flavor. It features a hydrogen peroxide-producing formula that excellently reduces plaque as well as tartar accumulation. You don’t need to rinse this toothpaste. Your pet can safely swallow it. It contains duel enzyme that works brilliantly to naturally starve-off bacteria. The enzyme is also great at stopping the formation of plaque. In the end, your dog is left enjoy nothing but fresh breath. Even if you pooch won’t permit you to brush his or her teeth, just the fact that the enzymes are present in the mouth will do a lot in terms of antibacterial action. The toothpaste doesn’t contain any foaming agents. The Virbac C.E.T. 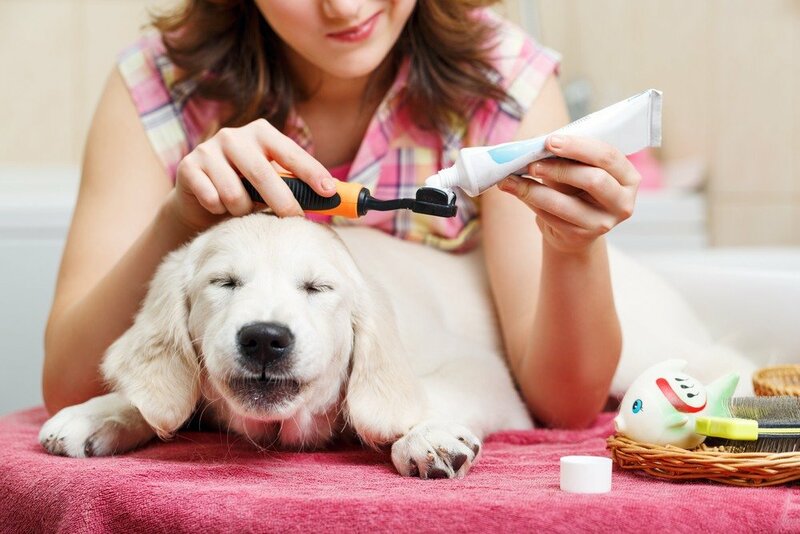 Poultry Toothpaste is a safe, appealing, and effective toothpaste for your pooch. It features the impressive C.E.T. Dual Enzyme system that inhibits plaque formation. It does not contain any foaming agents. Your dog can safely swallow it. It comes in well-accepted flavors thus making brushing incredibly easy. The toothpaste also targets gum diseases that lead to bleeding and sensitive gums or loss of teeth. Without proper oral hygiene, your dog’s teeth can turn yellow. It not only embarrasses your pet, it also does the same to you. The best thing is that this toothpaste can help you change the yellow teeth to gleaming whites. While other toothpastes struggle to leave a noticeable difference within days of use, this one will amaze you. It boasts impressive whitening abilities. The Ark Naturals Breathless Brushless Toothpaste is a remarkable dental chew for your dog. It’s highly effective for bacteria, tartar and plaque control. With this toothpaste for your pooch, your dog’s teeth are surely in safe hands. The digestible dental chew is all natural and clinically proven. You can get in different flavors such as cloven, vanilla, cinnamon, and alfalfa. They are all handy in helping freshen the breath of your dog. Since the toothpaste brings with it different flavor options, your dog will really look forward to it. He or she will not give you a hard time at all during brushing. In fact, chances are high that your pet will be excited during the whole experience. Attractive and sweet flavors make the brushing experience fun. Both you and your dog will love it. Are you looking for the best dog toothbrush accompanied by your dog toothpaste? Then your search has come to an end. Use the vanilla flavored KissAble Dog Toothpaste to ensure the oral hygiene of your dog remains in check. It works brilliantly with the Kissable Toothbrush. The Kissable toothbrush has soft bristles that massage your pet’s gums. It also features firmer bristles to effectively clean the teeth. It contains 3 ingredients phosphate, tetrapotassium, and tetrasodium all of which are highly effective at reducing the buildup of tar. The kissable toothpaste leaves your dog enjoying a long lasting fresh-smelling breath. Let your dog enjoy the natural and sugar free EZ Toothpaste for dogs as you brush his or her teeth every day. The toothpaste is sweetened with stevia thus making it very easy to use. Your dog will surely fall in love with the Vanilla mint flavor. It leaves such a delightful breath in your dog’s mouth. Because it contains no foaming agents, you don’t want have to worry about your dog’s safety if he or she happens to swallow it. Another impressive attribute about this dog toothpaste is the fact that does not bring with it any nasty smell. We know how nasty smells are a major turnoff to our pets. They are not only irritating but also annoying. Your dog will love the nasty-smell free nature of this paste. That is for sure. The Petrodex Natural Dog Dental Care Kit is an all-natural dental care kit for your dog. It brings with it the peanut flavor that most dogs will surely love. It also has all natural abrasives. With the toothpaste, fighting bad breath and plaque has never been easier. The enzymes contained in this toothpaste not only slow down tartar development; they actually assist in reversing its build up. They are also handy in combating an array of other problems such as teeth yellowing. With on-going use, the dental hygiene of your dog will always remain impressive. The CET Toothpaste Vanilla/Mint offers the best home dental care for your dog. It’s incredibly formulated to be appealing, effective, and safe for your pooch. The toothpaste is excellent designed to reach even the hardest to reach of surfaces in your pet’s teeth. It brings with it soft bristles that don’t irritate the sensitive gums of your pet’s teeth. You can choose from an array of five different flavors available. The creators of this toothpaste have put together a special bundle that makes it one of the most cost effective dog toothpastes in the market. Simply, I ​found this attribute a big plus for this toothpaste. The Nylabone Advanced Oral Care 2.5 oz Tartar Control Dog Toothpaste offers effortless oral care thus leaving your pet with healthy gums and teeth as well as fresh breath. It’s made with Denta-C that’s proven scientifically to reduce all the plaque that harbors bacteria. This tartar control toothpaste has a sweet dog-bone flavor that allows you to freshen and clean your dog’s mouth with utmost ease. However, it’s ​totally ​perfect to help control and/or eliminate tartar and plaque buildup. The Arm & Hammer Tartar Control Toothpaste offers a gentle but highly effective cleaning. It makes it very easy for any pet owner to provide effective dental health solutions that work. Let your pet enjoy this baking soda infused kind of dental care. Your dog will always enjoy some fresh breath. In addition to boasting the mentioned incredible attributes, this dog toothpaste is also one of the most affordable in the market. If you want a toothpaste that will work wonders on your dog’s teeth but are strained in terms of budget, then this toothpaste is your best bet. The Enzadent Pet Toothpaste features a poultry flavor. It also boasts of the triple Enzyme system that’s known to be magical in getting rid of plaque from the teeth. One of the best attributes about this toothpaste is the fact that it is foam less. Therefore, you do not need to rinse it at all. Your pet can safely swallow it. The fact that it is highly palatable means that your dog will not have a difficult time using it. You can use it daily or as prescribed by your veterinarian. ​To most dog owners, their favorite part is when they arrive home to a love-showering and heartwarming greeting from their dogs. Let us face, we need to reassure our pets that we still love them even after a hard day’s work. Nonetheless, when enjoying the greetings with full of kisses, licks and hugs, a stinky breath can really be a put off. It ruins the magic moment completely. To avoid such weird moments, it is important to make sure that you brush his or her teeth every day. The last thing you want to experience that awful breath from your pooch. Avoid it by doing your part. ​Primarily, you need a specially designed dog toothbrush. Next, give your pooch a trifling sample of the paste to taste. To expose outside surface of his or her teeth and gums, lift the lip. With gentle motions, brush to clean gums and teeth, just like you would your own! Since many pets wouldn’t allow brushing on the inside surface, clean the cheek facing surfaces. Ensure you reach canines and the upper back molars. These teeth quickly build up tar. After successfully brushing his or her teeth, reward the dog with some play. Doing so goes miles in reinforcing the brushing process. How ​Often ​Do ​You ​Brush ​Your ​Dog's ​Teeth & ​Why? ​In order to get the most out of the dog toothpaste I’ve highlighted in this primer, you’ll need to stick to a brushing schedule. Brushing your pet’s teeth once a day ensures you experience amazing results. In fact, you stand to observe rapid and consistent progress in the dental condition of your dog. ​According to many dog owners, brushing your dog’s teeth perfectly twice a month will yield impressive results. Nothing could be further from the truth. Twice per month is not optimal at all. You might as well avoid investing in any of the products I’ve mentioned here, if you plan to observe such a laid back timetable. You need to brush the teeth of your dog every day in order to enjoy positive results. ​Enzymatic toothpaste is rich in an enzyme by the name glucose oxidase. The enzyme is made from a fungus that produces penicillin. When in the presence of oxygen and glucose, glucose oxidase becomes antibacterial. The enzyme is great at generating hydrogen peroxide that effectively targets tartar and plaque. Unlike the human toothpaste, you don’t have to rinse enzymatic toothpaste. Your pooch can safely swallow it. ​How Do You Make Dog Toothpaste? This debate has been on for many years. Nothing beats the professional cleaning conducted by a veterinarian. Granted, taking your time to brush your pet is highly important. However, there are some spots you’ll have difficulty accessing. Let him or her enjoy professional cleaning from an expert once or twice per year. There is no doubt that dental chew products have come such a long way. Unquestionably, they make a big impact on the overall oral health of your dog. Depending on how effectively you brush your dog’s teeth and the chew, the results definitely vary. If he or she is patient, then brushing will do. If your pooch is uncomfortable or impatient with brushing, then dental chew is the route to take. Why is a Dog’s Dental Hygiene Important? ​Your dog’s oral hygiene is very important because it plays a huge role is his or her health. Of great importance to note is the fact that you must put consistent effort to ensure your pooch remains at the best that it should be. The sad truth is that occasional brushing hardly bears any fruits. In fact, it does not benefit the pet that much in the long run. You must purpose to brush his or her teeth on a regular basis so that he or she enjoys the greatest benefits. ​Poor hygiene not only affects the dog’s teeth, but the entire body. Damage within the mouth includes destruction to and/or loss of gum tissue. It also affects the bone around his teeth as well the development of a hole, which can result from oral activity. By the time your dog celebrates her or his 3rd birthday, he or she can start to show signs and symptoms of some dental disease. For sure, this is to quite expected, especially if you don’t take great care of the teeth. I’m sure if you fail to brush your teeth for three years, things can really turn out for the worst. There is no exception with a dog. Therefore, understanding the great importance of oral hygiene to your dog, how best can you take care of his or her teeth? For starters, as part of your pet’s frequent dental hygiene program, you should provide some chews. Natural dental sticks can also be magical. Dogs are very much into human food. They beg and whine for it. Others plot of ways to steal food whenever you aren’t looking. Why not give them and avoid all the hassle? In this case, we aren’t talking about your plate’s left overs! I’m referring to fresh, nutritious, and healthy foods such as apple or carrot sticks. ​Crunching down on such healthy alternatives will actually do wonders as far as his or her dental health is concerned. They use the sticks to polish and rub both outside and inside of the teeth. ​To many dog owners, brushing their pooch is unnecessary. Actually, many only perform the task when their pet’s breath gets stinky – or their veterinarian suggests it. Ensuring his or her teeth is brushed guarantees healthy gums and teeth. However, more importantly, it goes miles in improving their overall health. ​Just like with humans, excellent oral hygiene prevents tooth decay. It means that even in sunset years, your pet will still be able to eat. Brushing your dog’s teeth can prolong the quality of their life. ​Preventing tartar build up means preventing gum diseases and inflamed gums. Additionally, it means that you’re preventing bacterial infections from spreading directly to the bloodstream. ​The bottom-line is, brushing your dog’s teeth not only gives them better breath, happier smile and prolongs their life, and it improves their life.To help you do a great job, I’ve highlighted the best dog toothpaste today. By using any of the toothpastes I’ve discussed above, there is no doubt that your pet will enjoy the best oral hygiene. Try any of the above toothpastes today and discover its magic. You can also read our top 10 dog hair clippers review​.